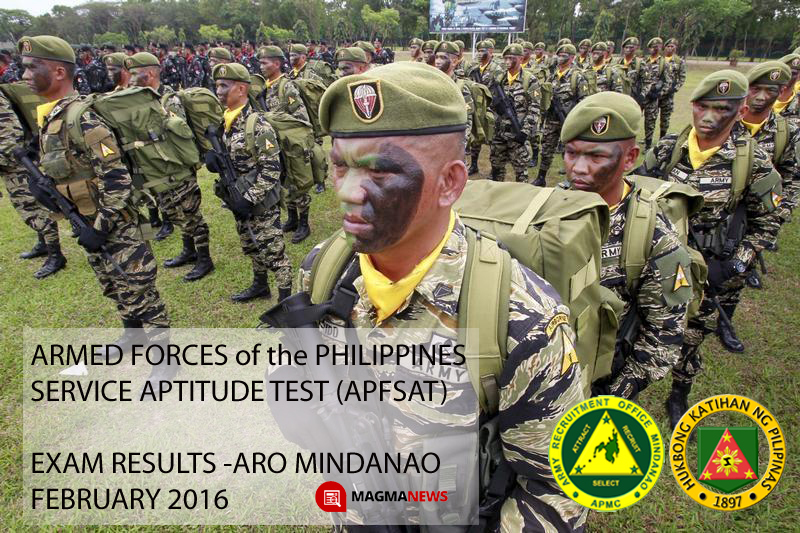 AFPSAT Results Release - Feb 2016 | ARO Mindanao - Exam News, Reviewer, Military Career, & Everything [MN] . .
Davao City, Philippines - The Army Recruitment Office in Mindanao has released the official results of the February 2016 AFPSAT conducted at Surigao, Agusan, Butuan,Bayugan, Bukidnon and CDO. 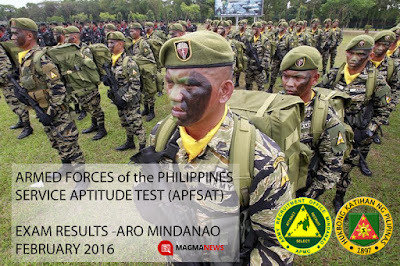 The Armed Forces of the Philippines Service Aptitude Test (AFPSAT) is a written military exam conducted for potential applicants of Officer Candidate Course (OCC), Officer Preparatory Course (OPC) and Candidate Soldier Course (CSC) in the Armed Forces of the Philippines. The master lists of results can be viewed on these links below by dates and testing centers. The Army Recruitment Office, Mindanao, APMC is located at Camp Evangelista, Patag, Cagayan de Oro City. It was constructed on 6 April 2004 by 544th construction engineer battalion, 52nd Engineer Brigade, Philippine Army and was completed on 15 September same year. This is funded under the army modernization program management office during the incumbency of Lt General EFREN L ABU Armed Forces of the Philippines, Commanding General, Philippine Army. Its mission is to attract, recruit and select high quality potential applicants for the Officer Candidate Course (OCC), Officer Preparatory Course (OPC) and Candidate Soldier Course (CSC) in order to fill-up the prescribed quota. Bookmark this page and follow us on facebook for more updates about AFPSAT and military exam results.